How much will modern smart home technology affect an appraisal, if at all? 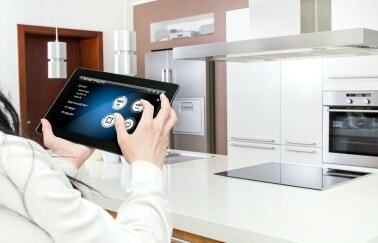 Nowadays, a homeowner can control just about any home device, remotely, via a smartphone: computers, HVAC, audio/visual equipment, surveillance cameras, ovens and slow cookers, you name it. Will a home that’s set up to handle all those capabilities be valued higher than one that’s still pretty 20th-century in terms of modern conveniences? Many of these remote-controlled features are not an innate part of the house, of course. They are the sellers’ personal possessions, and the seller takes them along when vacating. But some features, such as an advanced security system, might include quite a lot of hardware that will stay with the house. Also, some houses are more tech-ready than others. They are set up to accept easily whatever electronic features the new owner may introduce. This difference may affect the appraised value of a home—or it may merely serve to motivate potential buyers. Other design features that may not be as high-tech could also affect both the selling price and the appraised value of a home, although the consensus among appraisers and brokers seems to be that they’ll influence the former more than the latter. According to Sacramento, California–based appraiser Ryan Lundquist, remote technologies are likely to saturate the home market, nationwide, over the next few years, and this development could affect home design, as well as consumer demand. “This technology encompasses everything you see on Amazon Echo ads, and then some—not just controlling your thermostat with a cell phone,” he says. “Some of these features, like security systems, are in place and will stay with the property, and they might serve as a bright shiny object that attracts buyers. “These features can help put prospective buyers over the edge and might affect what they’re willing to pay. However, I don’t think we’ll be giving specific appraisal adjustments if there’s a smart thermostat in the house. Buyers won’t say, ‘I’ll pay $200 more for that feature,’ but those features might make them more eager to buy and pay a little more—and maybe the appraiser will notice and evaluate a little higher. James R. McLauchlen, of James R. McLauchlen Real Estate and Appraisals in Southampton, New York, deals largely with multi-million-dollar vacation homes. He agrees with Lundquist that the latest technological features might make the buyer more eager to shake hands, but he can’t be sure that the seller will recapture the expense of installing them, or that they’ll affect appraised values. Another factor that militates against technological features affecting home values much is that what’s new today will be old and obsolete before you know it. A homeowner might install a certain feature, only to find in a year that the house next door sports an updated and superior version of the same. The latest technological features certainly could affect the value of income-producing properties, such as luxury rental apartments. Conveniences drive rents to some degree, and demand for rental housing tends to rise when the economy adjusts downward—as many observers predict it will, in the next year or two. Remote technology could be applied to common areas in apartment buildings, such as pools, fire pits, parking lots, gaming areas, and media rooms. It could also serve to make concierge service more comprehensive, and make retailing easier—particularly the ordering of food from nearby supermarkets and restaurants. Features such as programmable and remote-controlled thermostats, and electric vehicle charging stations, could contribute to a building’s reputation for environmental responsibility. These features, however, are more likely to influence the per-square-foot rent, and the return on investment, than the appraisal. Retrofits for an aging population might also enhance a home’s appeal, whether it’s a private house or a condo apartment. Older people are often unsteady on their feet; stairs are sometimes a problem; wheelchairs and scooters sometimes have to be accommodated. Kitchens that are especially well suited to the old or disabled can sometimes be a selling point; so are slab-built homes that have no basement, foundation, threshold, or stairs, but plenty of storage space in the garage. Forever Builders, in Farmington Hills, Michigan, builds these using insulated concrete forms for greater energy efficiency, with radiant heat and metal framing: expensive to build, but the absence of a basement neutralizes the extra cost of materials. Homes for seniors might offer larger rooms and doorways and more open floor plans for better wheelchair access. These features might also be popular with younger homebuyers who are looking forward to aging in place and avoiding assisted living forever. Have you encountered any smart home features when appraising properties? Have they affected the property value? Weigh in and give your insights in the comments below. Article by Joseph Dobrian. Joseph Dobrian has been writing about commercial and residential real estate, and real estate-related finance, for more than 30 years. His by-line has appeared in The Wall Street Journal, The New York Times, The New Yorker, Real Estate Forum, Journal of Property Management, and many other publications. He is also a noted novelist, essayist, and translator. His website is www.josephdobrian.com, and he can be contacted at jdobrian@aol.com.